It’s tough to find something new to say about a project that you’ve talked about on numerous occasions, and when that critique is always positive, it becomes harder to say something that will mean anything to anyone other than yourself or the band in question. It becomes something that everyone reading has read before, and will read again, yet sometimes the music and the heart is so true, that it doesn’t matter. That you love it so much and feel it so keenly that you need to spill the words on the electronic page in order to feel complete. Often records come along that need to be spoken about, that need to be felt, that must be heard and while this introduction is more a way of justifying reviewing Panopticon yet again, it’s also a way of putting my own thoughts together. 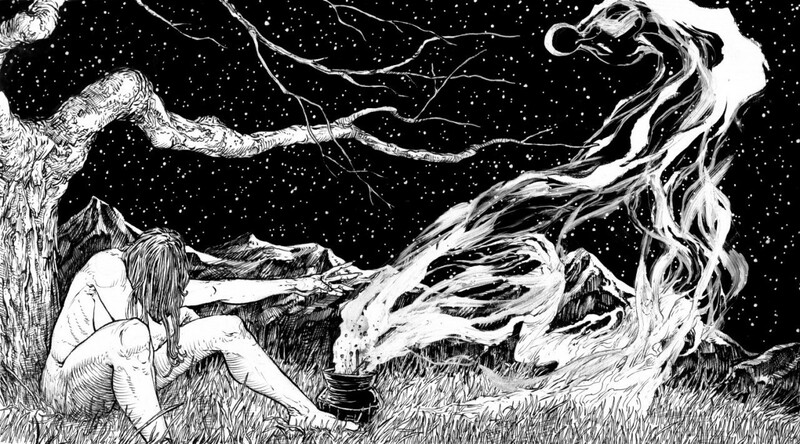 Where previous records have gone from being hugely crust/black metal (Panopticon) influenced to political (Social Disservices) to more folky and historical (Kentucky), Autumn Eternal holds back on the traditional elements and instead wraps subdued moments into layers of harsher, bleak tones. The Panopticon that we’ve come to know on later releases is mostly evident on opener “Tamarack’s Gold Returns” – a sweet nod to the turning of the colour of the leaves of the Tamarack tree – with the use of Johan Becker’s gorgeous strings adding depth and emotion to the instrumental opening. “Into the North Woods” follows and immediately sets the tone for the rest of the record. Beautiful guitars run underneath a current of sorrow yet Austin Lunn’s voice lays over it all with a hint of severity and anguish that brings the two opposing forces of sound together to create a song that speaks to the heart and pulls it into darkness. This record is incredibly personal, as is all of Lunn’s work, and where Roads to the North is a record of finding oneself, or hoping to at least, Autumn Eternal is a record that speaks of feeling utterly lost. It’s as though Lunn hasn’t quite managed to find the peace that he’s been seeking but as the record unfolds, there’s a knowledge that one day a place for him will be found. It’s not an unusual feeling to have, but it’s clearly one that wasn’t expected. Life doesn’t pan out the way you’d like, and Autumn Eternal is a testament to coming to terms with that. The title track is a fiery number with a pace that feels urgent, slightly desperate but entirely beautiful. The music that ebbs beneath the mournful voice is bittersweet and sorrowful, with Lunn dredging his emotion to the surface and laying his soul completely bare. Small passages of quiet are tinged with echoing screams and the short respite is broken quickly by the heady beat of the drums. “Autumn Eternal” is laced with sadness and the track moves through serenity and anger in bursts that mirror the human condition and continue into the dynamic “Sleep to the Sound of the Waves Crashing” which is one of the most intense compositions on the record. The song begins on huge washes of sound that build and create textures of despair from the harrowing vocal lines while Johan Becker lends a sublime note of ecclesiastical violin and Nostarion from Dämmerfarben imbues grace into the proceedings which gentle cello passages. Of course, such sweetness isn’t made to last forever and soon the track collapses back into itself with a slyly hidden choral style line running through masses of drums and guitar which pushes towards the end point and segues into “Pale Ghosts” and a grief that feels complete. Autumn Eternal is a record that most, if not everyone can relate to. It’s a record that speaks of the unknown and of being unsure of your own self. Of wondering where your path is taking you but knowing that there is light at the end. “A Superior Lament” is a doomed yet elegant piece that says all of that and more, in a much more effective way. Featuring the graceful vocals of Petri Eskelinen from Rapture and Feastem, the song is a huge, rolling work that flows on resonant guitars and a driving beat that creates the backbone of the song. There’s a wondrous appeal to the song that embraces you in its shadows, the sadness cloaking you and allowing you to feel its majesty and it’s in this ability to speak to the masses that Austin Lunn has excelled. While his work is very personal, there’s something here that is easy to latch on to and understand. “The Winds Farewell” closes Autumn Eternal on an instrumental piece that sums up the entire feeling of the record. Sadness, uncertainty and aimlessness appear, but the shade is dappled with light. Lunn may not have found his home yet, but he knows that it awaits him. Autumn Eternal will be available in October via Bindrune Recordings (US) and Nordvis (Europe). You can find a small teaser below. That’s really lovely to read. Thank you!